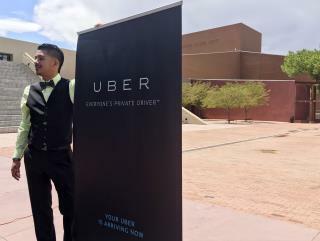 (Newser) – Uber has been fighting tooth and nail to keep its drivers classified as independent contractors rather than employees, with success. Now, a speed bump in New York: The state's Department of Labor in August and September ruled that two Uber drivers are eligible for unemployment payments, the New York Times has learned. That's a benefit extended to only those workers determined to be employees, which was the conclusion the department came to in these instances. Were these drivers deactivated by Uber for poor performance or traffic violations? If not, how do they end up with unemployment when the app is available for use whenever they want to use it? Expect this to be fought by industries far and wide that use the contracting business model, starting with damn near every newspaper in the country. awful ruling, that judge is crazy.